Zingerman's Creamery Gelato for sale. Buy online at Zingerman's Mail Order. Gourmet Gifts. Food Gifts. Italy's famous ice cream, made here in Ann Arbor! Thick, creamy, elegant, luscious. 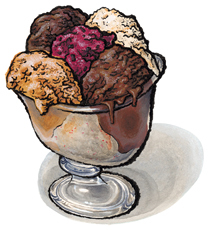 Eating gelato is an event, a special occasion that borders on a religious experience for ice cream connoisseurs. At Zingerman's Creamery, our gelato makers mix fresh milk from Calder Dairy—one of the last farmstead dairies in Michigan—with organic Demerara sugar and an array of other great ingredients to churn out this Italian-style ice cream with direct, intense flavors. Your box of five gelati is shipped frozen with dry ice. If you order two different things going to the same address, then they'll arrive in two boxes. Wanna make a flavor swap? Select your own assortment of five pints of gelato here.